Sleepover time and my "baby" was a champ! How far behind am I on my posts? Well, the sleepover was two weeks ago and I am finally getting around to telling the story. I am going to blame this one on the sis, she was holding this photo hostage or at least it took a couple of days to email it to me. And, I wouldn't want to post without a picture, that would require too many descriptive words. 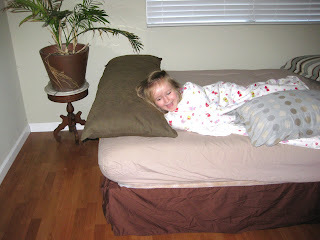 We prepped Vera for staying the night at her aunt's house for about a week beforehand. What sealed the deal, Vera was going to get to stay the night with Leroy and George (the pugs). If lucky, she would get to walk them and maybe order them around a bit. Yeah, our little mama is quite a bossy bee when it comes to things smaller than her, younger, or any of her friends. All that prepping = me having to explain each and every day leading up to the night that, "No, you still have 7 days left before your sleepover." Now, repeat that same phrase 10 times a day decreasing the number by one each day for a week and you can feel my pain. The day arrived and I was a little misty, my baby was growing up and all that good stuff. She had no such reservations, hopped in the car, and sped away for a night of fun. The fact that my sister recorded a couple of dog shows for her helped speed up the process. They ate Gouda Mac 'n Cheese, played with the pups, and knitted. Plus, she got to sleep in, for her, a really big bed...can you see how much she loves it? Vera looks like one happy camper! You left out the part where she told Uncle 1950s that I was "boring."